New York State is falling behind its neighbors to the north, south, east, and west when it comes to solar P.V. electricity generation. State legislatures in New Jersey, Pennsylvania, Massachusetts, and Connecticut have all taken an aggressive approach towards incentivizing solar installations atop commercial properties. Additionally, New York’s Canadian neighbor, Ontario, is rapidly positioning itself at the center of North America’s solar industry. Recently, there have been statewide efforts to create similar legislation in New York State, but those efforts have been forestalled by at least one year. To date, the only major successes in New York have come locally, for instance in Mayor Bloomberg's PlaNYC, which establishes ambitious targets for the total number of solar panels installed in New York City. In the United States the three economic incentives that justify a solar P.V. project are: 1) energy savings; 2) federal tax savings; and 3) local incentives, which may take the form of Renewable Energy Certificates (REC's), state tax incentives, and local utility incentives or some mixture thereof. All three major incentives are needed to provide an acceptable economic return. Since New York has very high electric rates and the federal incentives are the same for everyone, New York could support better-than-average economic returns from solar merely by having a comparable Solar Renewable Energy Certificate (S-REC) system to, say, the New Jersey system. Solar P.V. installation and maintenance are extremely important means of creating jobs. Solar energy also helps to promote energy independence and reliable energy distribution. For both of these reasons, it is to New York's advantage that the state legislature creates comprehensive solar-incentivizing legislation. As the federal tax incentives related to solar have an expiration date, it is important for the New York state legislature to act now. There are multiple 30% or 10% tax credits available through the American Recovery and Reinvestment Act to building owners in every state for a variety of alternative energy measures, with varying credit termination dates. For example, the 30% solar tax and fuel tax credits expire January 1st 2017 while the 10% Combined Power tax credit also expires January 1st 2017. The 30% closed loop and open loop biomass credit expires January 1st, 2014. All alternative energy measures that are eligible for the 30% and 10% tax credits are also eligible for equivalent cash grants for the three years staring January 1st 2009 and ending December 31st 2011. The credits described above are ordinarily eligible for 5 year MACRS depreciation, but building owners who install these renewable energy systems after September 8, 2010 through December 31, 2011 can take 100% depreciation tax bonus immediately. Even if building owners miss this 2011 window, they can enjoy a 50% tax depreciation bonus on alternative energy equipment placed in service from January 1, 2011 through December 31, 2012. Using the doughnut metaphor, New York is the hollow center surrounded by states that represent the substantive portion of the doughnut. In other words, states bordering New York on all sides have become havens for solar installations by virtue of their statewide policies, while New York has become a void for property owners considering the switch to solar P.V. 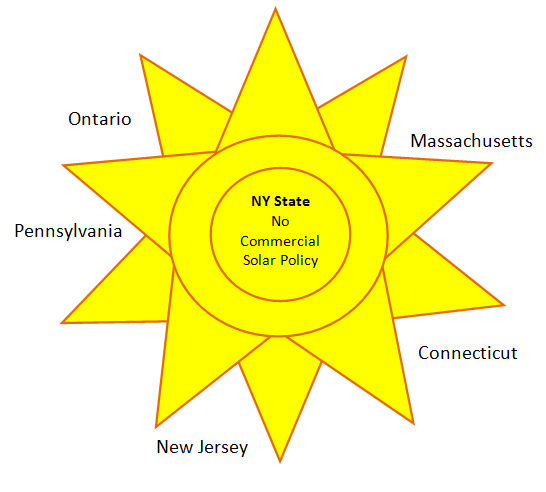 The following figure illustrates the New York solar doughnut, with detailed descriptions of the surrounding states’ solar policies below. States that enact solar incentives also experience a measurable improvement in building energy efficiency. This important added advantage occurs because property owners installing solar P.V. first endeavor to make their buildings as energy-efficient as possible. One of the most frequent investments is the installation of energy-efficient lighting, which can be eligible for a substantial Section 179D EPAct tax benefit if prescribed wattage reduction targets are achieved. New Jersey is the nation's second leading state as measured by its solar electricity generation capacity, which is no small feat considering that the national leader, California, has four times the population. There are a variety of factors that have pushed New Jersey towards rooftop solar P.V. electricity generation, including the fact that it is the most densely populated state with nary the room to build utility-scale natural gas, coal, or even renewable energy generation facilities. That, combined with New Jersey's notoriously tough environmental regulations, has forced policymakers to enact several significant pieces of legislation to promote commercial and residential installation of rooftop solar P.V. systems. New Jersey has enacted its Clean Energy Program with the hopes of stimulating investment in rooftop solar P.V. By requiring utility companies to include minimum percentages of renewable energy in the electricity they sell, the state's legislature has provided utility companies with three options for complying with their obligations: 1) purchasing S-REC's generated by grid-connected rooftop solar P.V. ; 2) paying a solar alternative compliance payment (SACP); or 3) generating their own solar electricity. By adding a system based on trading S-REC's, which are basically a unit of energy producing credit (specifically the energy attributes of a megawatt hour of electricity), to federal tax incentives already available to property owners throughout the state, New Jersey primed the pump for heavy investments in solar, and indeed that is what's followed. In Reporting Year 2009 (RY09), which ended on May 31, 2009, New Jersey required that a minimum of 3.84% of retail electricity sold by suppliers/providers came from renewable energy, 100% of that target was achieved through the purchase of S-RECS. Utilities purchase these credits on the open marketplace, which tend to be cheaper than their equivalent compliance payments that are fixed fees determined by the state. However, S-REC’s get distinct treatment under the state’s regime, and in RY09 there were not enough S-REC’s to meet the minimum percentage require for solar electric generation. Fortunately, in the two years since, there has been a boom in solar P.V. system installations in order to fill this gap. In addition to New Jersey’s robust incentives program, the state has created a strong technical and legal infrastructure to facilitate grid interconnection and facilitative net metering standards. These standards allow for the optimal distribution of power across the grid, which in turn makes the solar P.V. installation process optimally efficient. Pennsylvania has followed suit with New Jersey in their aggressive use of S-REC’s to finance solar P.V. installations. In addition, the state has put forth the Pennsylvania Sunshine Solar Program, which will provide residential and small business owners $100 million in rebates to fund solar electricity and solar hot water. They’ve also established ambitious targets for alternative energy generation – 18% of total retail electricity sold by 2021 – and have given solar preferential treatment with what’s called the “Solar Share.” The Solar Share represents a significant portion of the state’s overall Renewable Portfolio Standard, as it is one of the largest solar energy mandates in the nation at 860 MW over the next 15 years, and will be met through a combination of S-REC’s and utility rebates. Several U.S. manufacturers have recently positioned themselves to take advantage of Canada’s advantageous solar policies, particularly in Ontario. Ontario has embraced Germany’s model of FIT’s (a law requiring utility companies to subsidize solar upstarts by buying their electricity at marked-up rates, making it easy for the newcomers to turn a profit ) in signing the Green Energy Act into law. As a result, it is the first North American jurisdiction with an incentive system that makes it highly lucrative to generate solar energy. Michigan-based United Solar (Uni-Solar) has closed part of its U.S. operation in favor of opening a $12 million plant in Ontario, which will be subsidized by the Canadian government. Uni-Solar decided to open a manufacturing plant in Lasalle, Ontario because the new law requires that the solar panels put to use locally are also manufactured locally in order to benefit from the incentive program. This has proven to be a win-win situation for both Unisolar and the local government, as the new manufacturing plant supplied 80 new jobs along with affordable, clean energy. To put the booming solar market in Ontario into perspective, consider that California-based Solarworld is shipping its solar P.V. modules into Ontario by the trainload in order to fulfill the demand for Ontario’s massive new Stardale PV Solar Project. On December 29th, 2010, Massachusetts announced a plan to reduce greenhouse gas (GHG) emissions by 25% below the 1990 standards over the next 10 years. This announcement comes on the heels of California’s similar announcement on December 16th, 2010 with a plan to reduce current emission back to the 1990 levels. In comparison to the California plan1, the Massachusetts plan relies largely on existing programs such as renewable energy mandates and commercial building efficiency standards2. These programs focus on exactly the same areas that are emphasized by the Federal tax incentives defined earlier. Recognizing that one-third of the Massachusetts emissions come from the transportation sector, the state is starting a pilot "pay as you drive" program that will reduce car insurance premiums based on miles driven. The federal tax system also contains major tax incentives for electric vehicles and battery charging systems which should help this initiative3. Massachusetts has also enacted the Green Communities Act of 2007, which encourages the state’s residents and businesses to invest in solar through a number of generous rebates. The most successful of these rebates has been the Commonwealth Solar Rebate Program. The result of this program, combined with Massachusetts’ embrace of S-REC’s, has been over 2,000 solar P.V. installations capable of producing 22 MW of electricity. Connecticut finances most of its renewable energy programs through the Connecticut Clean Energy Fund (CCEF), which is funded by a surcharge imposed on all residential and commercial electricity bills. Funds are then distributed to homeowners in the form of a direct subsidy on a per wattage basis for solar P.V installations. However, Connecticut’s comprehensive solar program does not end there; the state brings its tax policy to bear on solar installations by offering a 100% exemption from property tax on solar energy systems, meaning that investing in solar will not increase one’s tax liability. How has New York Fallen Behind? It may come as a surprise that a state at the center of the world economy has failed to adopt legislation that will usher in a new era of energy independence, which will inevitably include solar in a big way. On February 25, 2011, the state legislature voted on passing a law that would create the New York Solar Industry Development and Jobs Act of 2011, and the outcome came as a disappointment to many solar advocates. The Act would have taken elements of each of the state programs outlined above and introduced New York to the S-REC trading system while simultaneously giving direct incentives to property owners and utilities who generate solar electricity. Yet, encouragingly, on June 22, 2011 the New York State Legislature passed the Power NY Act of 2011, which, with respect to renewable energy generation, revives Article X of the Public Service Law thereby creating an expedited, state-led program for permitting electric generating facilities while preempting local requirements. The effect of this change will be a uniform, easily understood process for solar P.V. installations, which are sometimes avoided because they are riddled with delays. However, the scope of the Act is somewhat narrow: it only applies to facilities producing at least 25 MW of power. While this bill ostensibly offers little direct funding towards renewable energy generation, accelerated permitting processes is a step in the right direction. New York is in danger of becoming the regional laggard in the solar industry. Before it becomes too late, the state must consider enacting a comprehensive renewable energy regime with a specific focus on solar energy generation. By aggressively incentivizing solar P.V. installation, New York State can facilitate a statewide shift towards energy independence and reliability while creating thousands of jobs. 1 - Goulding, Charles & Taylor Goulding. “Tax Opportunities for 360 California Companies’ Cap and Trade Compliance” Corporate Business Taxation Monthly. 3 - Goulding, Charles, Raymond Kumar and Taylor Goulding. “Providing Tax Advice for an Electric Car Environment” Corporate Business Taxation Monthly. Taylor Goulding is a Tax Analyst with Energy Tax Savers, Inc.